In the mid-1800s, seeing a mill in New England was about as common as spotting a Red Sox or Patriots cap is today. There were thousands of mills scattered across the region, and towns depended on these local factories not just for the items produced, but even more so for the jobs. Southern Maine’s cities of Saco and Biddeford alone formed one of the largest cotton milling areas in the entire country, and that’s to say nothing of the mills in the state that produced lumber, paper, iron or other products. As the decades passed and times changed, these mills began to close down, and the once-essential buildings became neglected and soon deteriorated—including an old textile mill known as Saco Mill #4, which shuttered in 1987. That same year, in the neighboring state of New Hampshire, a company called Chinburg Properties was founded by Eric Chinburg as a single-family homebuilder. Nearly 30 years later, Saco Mill #4 and Chinburg would end up crossing paths. The redevelopment potential of these defunct mills was obvious, as many of them are located in walkable downtowns, are convenient to railway stations or are situated near rivers or on coastlines. Chinburg wasn’t the first company to see the potential for apartments in the enormous 250,000-square-foot facility that measures more than two football fields in length. 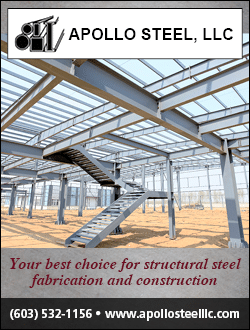 It was previously purchased by at least two developers in the late 1980s and late 2000s, but the intimidating scope of work, coupled with economic downturns, forced these companies to scrap their plans and put the mill back on the market. “It’s had a 30-year history of trying to be developed and changing hands,” says Matt Assia, Chinburg’s director of asset management. After cutting its teeth on increasingly larger projects in its first decade of business—including numerous successful mill renovations beginning in 1996—family-owned Chinburg jumped at the chance to acquire Saco Mill #4 in 2014, when the economy was on an upswing and the housing market in nearby Portland was officially blowing up. The brawny brick façade saved the building from needing a substantial exterior facelift, but most of the mill’s 900 windows had been destroyed since its closing, meaning the interior surfaces were subjected to almost 30 years of weather damage from coastal winds, falling rain and Maine’s brutal winters. But the bones of the building proved strong. “The majority of the structural heavy timber framing that was constructed in the 1800s remained—and still remains—intact,” Assia says. When it came time to tackle the interior, Chinburg didn’t just want livability; it aimed to raise the standard of living for future residents. 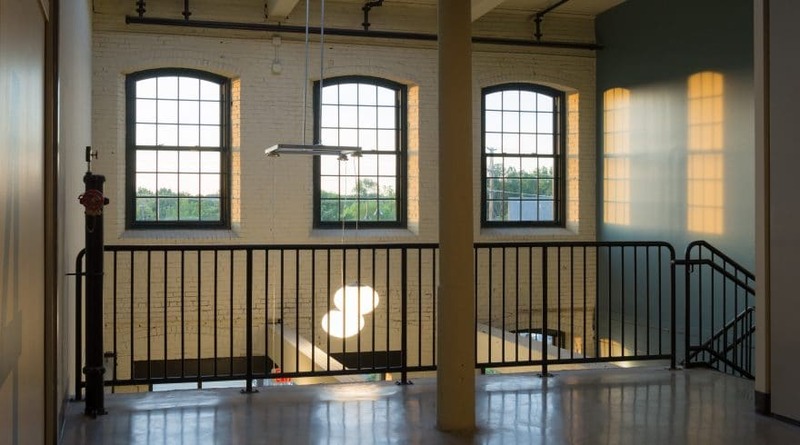 Sandblasting removed layers of old paint, exposing the original brick and wooden beams underneath, which now complement the 14-foot ceilings and new six-foot-tall windows that allow ample light to enter each of the mill’s 150 units. 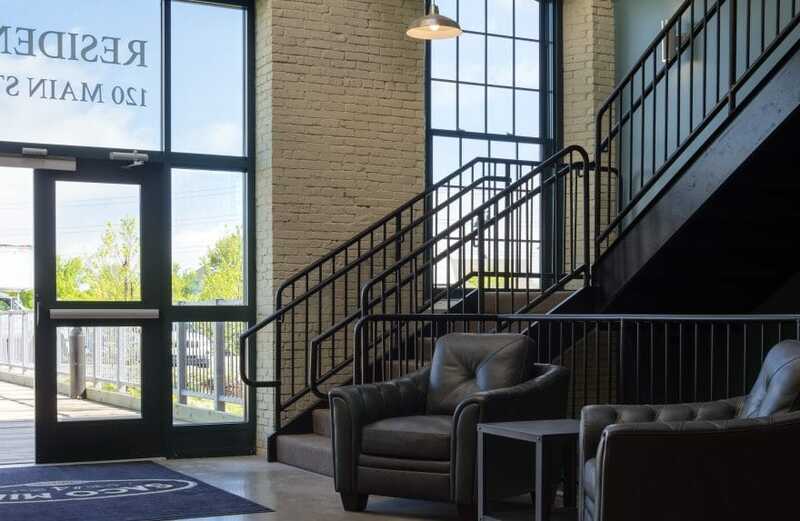 Although the apartments maintain a classic industrial feel, they are also equipped with heated concrete floors, high-end appliances, ceiling fans, and handsome wooden cabinets and solid granite countertops in both the kitchens and bathrooms. In addition to an impressive new lobby, Chinburg has constructed several communal areas. The most notable may be the community room, which can be booked by residents for events, parties and other social gatherings, and features a TV, foosball table, private bathroom and plenty of cushy seats. Chinburg also successfully completed a roof deck renovation, located four stories above the ground level with views down the Saco River. Additionally, there’s a gym complete with a yoga and stretching area, as well as two lounges—one for working and one for relaxing. There are two more hangout spaces in each of the building’s two stair towers. In this dog-eat-dog world of redevelopment, even dogs are made to feel welcome at Saco Mill #4. On top of allowing some pet-friendly apartments, there’s also a smattering of doggie waste stations around the property and a pet grooming room and dog wash on the basement level. “We find that if we provide community space for residents to use, then they benefit from the extra space and accommodations without having to pay for it in their rent check,” Assia says, adding that Chinburg also offers on-site storage units for residents with more possessions than apartment space, similar to the garage door variety seen at standalone facilities. Another thing residents don’t need to pay for? Wi-Fi. In today’s high-tech world, more and more people are getting used to free wireless internet, and Chinburg is happy to oblige them, Assia says. The company began its site work and building cleanout in September 2015, received its final occupancy permit on May 31, 2017, and before the end of the first week in June, Saco Mills #4 was 100-percent full. The appeal of Southern Maine also played a role in the mill’s success. “You don’t need to live in larger areas to have a high quality of life,” Assia opines. And you don’t need to fork over a fortune either. Assia calls the rent prices “consistent and competitive within the market” without scaring off renters at either end of the income spectrum. According to Assia, there aren’t a lot of new or newly renovated, professionally managed apartment buildings in Southern Maine, and Chinburg hopes to take on more projects in the near future. In fact, the company has already partnered with the owner of a vacant property in nearby Biddeford, Maine—the Lincoln Mill—which is even larger in scope and will offer 181 units, a “New York City-style lobby” and a restaurant.